We would love to hear about your experience at Keith Nusinov Jewelers. 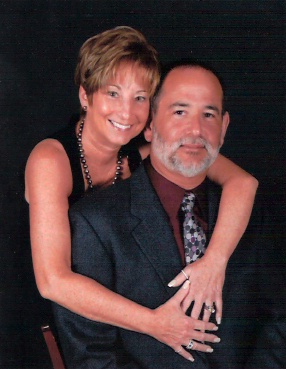 Keith and Andrea Nusinov opened Keith Nusinov Jewelers in 1998, their experience in the jewelry business exceeds 58 years! As a third generation Nusinov jeweler, Keith began his apprenticeship at the age of eight. He learned every aspect of the jewelry business peering over the shoulders of the other jewelers and watching his father, as he would skillfully repair watches. He learned early in his career, the importance of repairing and restoring jewelry heirlooms, and that customer service is the most essential element in a successful family business. Customers know that when they visit Keith and Andrea Nusinov, that the experience will be satisfying. Keith and Andrea listen to their customers, help them understand what they are buying and are sensitive to their budgets as well. Whether it’s an engagement ring, a custom piece of jewelry that Keith is designing, a purchase to celebrate a special occasion, or restoring an heirloom, Keith and Andrea will help you every step of the way with their unsurpassed knowledge, honesty and customer service. As one of the sons of Charles Nusinov & Sons, Bob Nusinov grew up in the family business. Originating in 1923, Nusinov is among Baltimore’s oldest names in the jewelry business. He learned every aspect of the business from his father. The only hiatus from helping run the family business was a stint in the Navy during the Korean War. 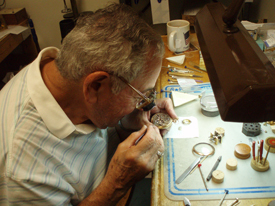 It was during this time that Bob honed his craft as an expert watchmaker after learning the trade of instrument repair aboard Navy ships. Bob Nusinov still works part time in the store with an expertise and craftsmanship that has earned him a reputation and a following for repairing watches from Timex to Rolex and everything in between! What Makes Keith Nusinov Different? As true animal lovers, we support Animal Rescue, which is a sanctuary for life shelter. In addition to our ongoing support, we will feature pets on occasion in search of a loving home. Please visit our Facebook Page link to learn more.